Right after we wrote about how our city’s current leadership can’t hold our post-Freddie Gray city together, the mayor’s nominee for police commissioner was run out of town by the testimony of 48 regular citizens who woke up on a Saturday morning to testify in front of the City Council. Mayor Pugh with Council President Young and Senator Ferguson announcing appointment No. 2 for commissioner. Things like this are not supposed to happen in our “strong mayor” system. Before that weekend our mayor was committed to her nominee and our City Council looked poised to confirm him. Then 48 of the fifty-one people who showed up to testify spoke out against him and everything changed. Now, anyone who has run a large organization should be wondering whether this is any way to make such an important hire. At least for the moment anyway, the controversy is past us, and a better choice for police commissioner has emerged. But if we look closely at the real reason why Joel Fitzgerald was not right person to lead our police department, we can find the source of this public outcry. The problem wasn’t his resume. It was his willingness to walk away from his own city in the middle of a reconciliation process that our city has not even started. The violent arrest of a black mother, Jacqueline Craig, by a white Fort Worth police officer, William Martin, in late 2016 , and the protests that came after. A year into Fitzgerald’s tenure in Fort Worth, Texas, seething tensions were exposed after the violent arrest of a black citizen by a white police officer. (Sounds familiar.) Hard realities about being black in that city rushed to the surface. (That too.) To respond to the fact that black folks make up 19% of the city but 41% of the arrests, and to confront the big differences between majority-black schools and neighborhoods and majority-white, Fort Worth started a task force. The task force is looking at improving policing practices, and the reason Fitzgerald wasn’t the right person for our department was his willingness to leave that work behind rather than see it through. Now let’s look in the mirror. We’ve been through far worse than Fort Worth. But we have no task force and no leader calling for one. Ever since the unrest we’ve needed to figure out how to reconcile the need for safe streets and with the demand for fair policing. But that conversation hasn’t even started. Much has been said about “process” — how the new commissioner should be chosen, how many public meetings do they need to attend. But little has been said about what policing in our city should look like today, and what vision and values a new commissioner should bring to the job. So it’s no surprise that when the public was invited to testify about the new police commissioner a bunch of very frustrated people showed up. Before there was Freddie Gray, there was Michael Brown. Before Baltimore 2015, there was Ferguson 2014, and a week of unrest in a small town outside St. Louis. Two moments of unrest. Two very different responses. The historical parallels between Baltimore and St. Louis are profound. 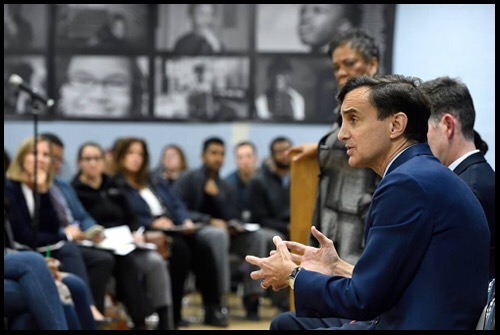 We are two great Border State cities anchoring regions that, still today, pay the price for a century of efforts to exclude working black people from good neighborhoods and real opportunity. St. Louis city was home to many free blacks before the Civil War, just like we were. The city was full of Union sympathizers, just like us. As a result, control of its police department was taken from the by a pro-South and pro-slavery state legislature. The same happened to us. St. Louis began to grow quickly in the 1840s with immigrants from Ireland and Germany – just like us. In fact, those immigrants almost certainly passed through our own Locust Point terminal to get there. Top: news coverage of Baltimore’s 1910 racial zoning law. Bottom: leaflet promoting the 1916 segregation law in St. Louis. In 1916 St. Louis passed a law that prohibited black people from moving to blocks where white people lived – just like we did in 1910, with the country’s very first racial zoning legislation. At the time, we had the largest population of African Americans of any city. St. Louis was second. The Supreme Court struck down racial zoning laws in 1917 (in a case coming from another Border State city, Louisville). After that, St. Louis began to use land covenants to prevent black families from moving to certain neighborhoods – just as we did to prevent blacks and Jews from moving into North Baltimore neighborhoods. It took until 1947 for the Supreme Court to rule these covenants unconstitutional (and it was a St. Louis case). When the federal government wanted to jump-start housing construction during the Great Depression, it decided what neighborhoods across the country were entitled to federally-backed mortgage guarantees. Whole swaths of St. Louis, including all of its black neighborhoods, were deemed ineligible – “redlined” just as black neighborhoods in Baltimore were redlined. This made homeownership and investment in these places next to impossible. Left, 20,000 black families were removed to demolish the Mill Creek neighborhood in the heart of St. Louis. Right, thousands were removed to construct the highway to nowhere, and from 1951 to 1971, 25,000 families were displaced in the name of urban renewal, 80 to 90 percent of them black. Starting two decades after the depression St. Louis obliterated many of these redlined neighborhoods – “blighted” by then for lack of investment – in the name of urban renewal. We did the same thing. During and after World War II, black folks came to both St. Louis and Baltimore for work, and white folks started to flee for segregated suburbs on the highways built where black neighborhoods once stood. 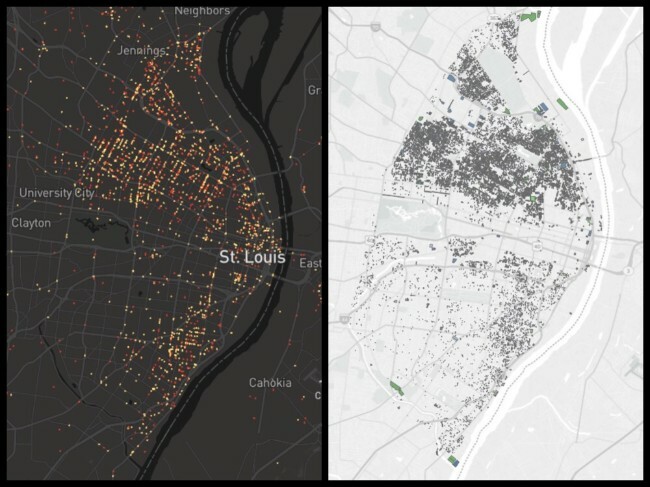 St Louis, the past five years of shootings on the left, a recent map of vacant buildings on the right. Baltimore, the past five years of shootings on the left, a recent map of vacant buildings on the right. These population shifts, and the foundation laid by a century of policy, helped create the hyper-segregated regions of both St. Louis and Baltimore where vacancy and violence is concentrated in just the places were red lines were drawn decades before. Then both cities had an uprising. Both cities should have taken the opportunity to face down this past, and to find the connection between today’s maps of shootings and vacant buildings and the maps drawn decades ago. But only one city has. What St. Louis did (and what Baltimore has not). After the Ferguson unrest it seems like the entire St. Louis region saw the opportunity (or the necessity) for real change. Government, local universities, grassroots groups, the philanthropic sector, and the private sector. They investigated their history. They created a political agenda to do something about it. And they are looking to consolidate city and county governments to dismantle barriers created long ago. Members of the Ferguson Commission. What kicked off the activity in St. Louis was the Ferguson Commission, called for by the Missouri governor. That was 10 months of meetings and research and expert testimony and public hearings and 20,000 hours of work from commissioners and other volunteers. In parallel with this Commission, public health experts at St. Louis’s Washington University created a project called For The Sake of All to fearlessly mine the history of the region and outline the challenge posed by a century of policies and real estate practices that created a segregated region. Using the work of the Commission, and turning what could be another pointless bunch of reports into a real political agenda, St. Louis City Hall just issued a series of benchmark indicators to measure the success or failure of efforts to dismantle the effects of this history. On top of all this, the private sector has taken the Ferguson unrest as the reason to press for a massive overhaul of regional political power. They’ve come to realize that the region won’t grow, and the city won’t attract the talent it needs, until the city/county divide, and the racial divide beneath it, is addressed through consolidation. All the Border State cities have regional divides based on race. In fact, they all have a single street that epitomizes the divide between black and white. Baltimore has York Road. Kansas City has Troost Avenue. Louisville has 9th Street. In St. Louis, it’s Delmar Boulevard. The Ferguson uprising has led the St. Louis region to do something about this map. The St. Louis regional situation is even more complicated than ours is here in Baltimore. Not only do they have a city and a county divided, but within that county they have 90 separate municipalities, many of which were created in the 1940s, 50s, and 60s specifically to exclude black families leaving the city for housing opportunities in the suburbs. That little town of Kirkwood, for example, prepared a plan in 1940 to shift its small black population to St. Louis because it was “more desirable for all of the colored families to be grouped in one major section.” And when in 1969 a nonprofit wanted to build federally subsidized multi-family housing in the white suburb of Black Jack, it quickly incorporated and adopted zoning rules to stop that project, and to stop black families from moving in. Ferguson of course is another one of these segregated little towns – a place where, in 2015, 93% of all people arrested were black, 92% of all police searches were of black people, and 86% of vehicle stops were of black drivers. The need to destroy these political barriers became undeniable post-2014, and the push for a St. Louis city-county consolidation has grown. Surely not everyone in favor is motivated by racial equity, but all kinds of people have come to agree – at least in principle – that the same barriers erected to preclude black people from opportunity are also barriers to regional growth and competitiveness. Don’t think we needed a Freddie Gray Commission? Think again. Our history and our challenges hardly differ from those of St. Louis. We were both rocked by unrest. We were both subjected to a harsh national spotlight. And we’re both in desperate need of radical reform. The difference is, they’ve done something. What have we done? Sure, there were meetings, there were conversations, there was some funding for youth jobs. But after “One Baltimore” fizzled out, what replaced it? Did our leaders and our major institutions unite to analyze the root causes of our own unrest and chart a path forward? Where were our public health experts? Where were our foundations? Who in our business community saw the connection between Sandtown and Downtown as the reason to push for significant reform of our broken government, and fractured regional relationships? So many wanted to be part of the solution after April 2015. The missing ingredient was leadership. Leadership capable of bringing people together, creating a framework for productive discussion, and taking our city through the hard conversations we needed to have then, and still do. For those who say it doesn’t matter that we skipped this step, who say, it’s been four years and it’s time just to get over it — look around. One of our most important institutions is engulfed in controversy because it wants its own police force in light of the incompetence of our own. Johns Hopkins is offering more help to keep streets safe but is facing significant neighborhood opposition, trapped by our unfinished accounting of the unjust application of police force in the past. Our homicide rate isn’t higher because there are more “bad guys with guns” than there were before 2015. It’s because cases aren’t getting closed and prosecutors aren’t winning cases. A major reason is that the public isn’t helping out because it doesn’t trust the system or the people running it. And let’s not forget the angry public testimony that brought down the mayor’s first choice for police commissioner. There is no serious, city-wide discussion of vision and policy and healing going on today, right when we need it the most. Baltimore Now exists to help fill this void, and to find others who want to help. We can’t replicate all that has been done in St. Louis over the past four years by so many people and institutions. We don’t have the resources, and we don’t have the time. Election 2020 is fast approaching and every day the window of opportunity to alter our course grows narrower. And make no mistake. Things in St. Louis are far from perfect. But they’re trying while we’re stagnating. They’re having a region-wide conversation about their future, while the only conversation our region is having is whether it’s safe to come to downtown. We have the chance to turn our challenges into opportunities for a new vision. What we need is a coalition of people from all sectors — from business and from the community, from the grassroots and the grasstops, the small nonprofits and the major institutions — who look at what St. Louis has done and want to get to work. Our current governor, Larry Hogan, created an organization called Change Maryland in 2011, because he said he wanted to lead the opposition to the Martin O’Malley administration. Hogan relied on the tried-and-true Republican version of “common sense” — lower taxes and lower spending — against a liberal Democrat, in an effort to create the conversation he wanted to have, and to find the people interested in having it. We’re trying to do something similar. But we don’t just want to lead the opposition to the direction our city is taking right now. We want to help create a new one. And our task is much different, and much harder. There are no off-the-shelf talking points to create the vision, and the reconciliation, our city needs. If these existed, someone would already be doing what we are. What we need almost more than anything else is a new common sense. A new way of viewing our city, its strengths, and its challenges, and a dramatic expansion of what’s considered possible. The work is hard but the goal is straightforward. Change Baltimore.